Last week I shared a complete training session for running with the ball. If you missed that one I’d suggest you go back and check out the podcast and printable show notes for all of the details. This has been a crazy week. I’ve jammed a week of work into four days. When this is released I’ll be on my way to Cincinnati, Ohio for the Flying Pig Half Marathon. It looks like it’s going to be a wet one! If anyone listening is going to be out there running or spectating I’d love to hear from you. This week I’m looking at formation for teams playing 7 v 7. Since this is going to be the new standard for U9 and U10 teams beginning next year I’ve had a number of questions about how to approach it. Including one from Jim in Massachusetts I don’t think that the formation should be a huge focus for teams a this developmental stage but the framework you choose will impact what your player learn from the game. I’ll discuss the six different formations that I think could be used for 7-a-side soccer along with the advantages and disadvantages of each one. I’ll also look at how using each one can teach your players something different about the game and how this smaller version of the game might transfer to the larger game as the players get older. At the end I’ll tell you which formation I prefer and give you some activities to train the key concepts that I think are important for your players to understand in order to play within the formation most effectively. Which Formation Should You Use? Over the next two years every state in the U.S. will move to 7-a-side soccer for U9 and U10 teams. Some have been using this format for years but others will be transitioning to it from 6v6, 8v8 or even 11v11. I thought this would be a good time to look at the different ways to organize a team to play 7 v 7. 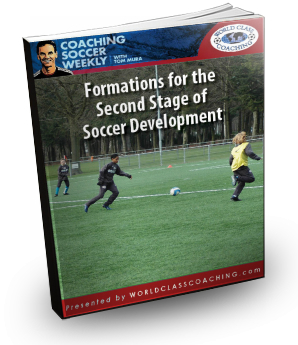 In episode 24, Formations for Small-Sided Soccer, I talked about my view that when you’re choosing a formation for these age groups the focus should be on how they are going to help or harm your ability to develop your PLAYERS not on which one is most likely to make your TEAM successful. There’s nothing wrong with having a successful team at U9 or U10 unless you’re sacrificing long term development for short term wins. I think you can have BOTH development and success but one has to have priority above the other. This decision will inform you choice of which formation or formations you use with your team. I prefer to use more than one because each one has its strengths and weaknesses but more importantly because each one can be used to train a different aspect of the game that will benefit the players as they move to the next level. There are three factors that I think you should take into consideration before choosing a formation: the size of the field, HOW you want to play and the experience level of your players. US Soccer is setting the maximum field size for this age group is 30 x 47. That’s a much more narrow field than most leagues and tournaments are using now. This makes it easier for two defenders to provide cover in the back. My preference is to use the 2-3-1 because: two defenders are enough, the width comes from the midfield, I like the angles of support that are created by the position of the players and there is ample space for the wide midfielders to take players on 1 v 1. These are exercises that I will use to prepare my teams to play the 2-3-1 formation next year. Training your players to defend in pairs will teach them how to pressure the ball and cover for each other making it easier for them to defend with only two in the back. I will use the variations in episode 35 – 11 Diamond Drill Variations to train the players to take advantage of the diamond passing options that are available in the 2-3-1 formation. Adding pressure in 4 v 1 and then 4 v 2 keep-away games will get them in the habit of playing into space and away from pressure. This passing pattern will train the players to create opportunities by moving in relation to each other. It can also be done to finish on goal by combining with the forward (Player D). These are just a few of the activities that can give your players the tools to get the most out of the 2-3-1 formation. I think it’s important choose a formation with will provide the framework for you to teach the players how to play the game. You may choose to stick with one system to make it easy for your players to then focus on how they’re playing rather than where they’re playing. You can also use two or three different ones to allow you to highlight a certain area. I would strongly suggest that you move your players from one position to another to expose them to playing in different areas of the field. This may bring out abilities that they didn’t even know they had. It also shows your players that every position is important. Everyone wants to score the goal and hear the cheers but we should educate our players (and their parents) that a great defensive play that saves a goal is just as important as a creative attacking play that scores one. You can now subscribe through Google Play Music to listen to the podcast on your Android device. Next week I’ll look at the final stage of development before the players move to the full sided game. I’ll breakdown the systems of play that can be used for the 9-a-side game and how to train your players for this important final step. Thanks for sharing your thoughts on the 7v7 formation. I would love to see the same thing for 9v9 as well. We are transitioning from 6v6 to 9v9 and I’m a little worried about the switch. I’m glad you enjoyed it Todd. I’ll be talking about 9v9 next week.